Successfully Added PlayMore - Multi-Platform Handheld Gaming Entertainment System (NES, GBA, Sega Genesis) to your Shopping Cart. 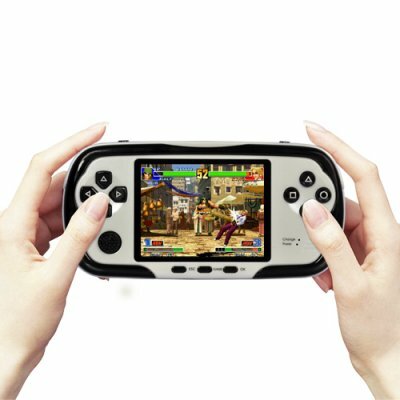 Old school gaming is back and better than ever with the PlayMore Multi-Platform Handheld Gaming Entertainment System. Featuring built-in NES, GBA, and Sega Genesis emulation, the PlayMore is the best way to relive joys from the past. Sega Genesis (Sega Master Drive): Sonic may be phased out today, but that doesn't mean you can't enjoy a blast from the past with this cool blue hedgehog. Other Sega Genesis favorites include Gunstar Heroes (must play if you haven't before!) and Streets of Rage for some good old face-smashing fun. NES (Nintendo Entertainment System): Experience the nightmare-inducing difficulty of Silver Surfer again, or have your kids tackle it on to let know what hard mode really means. As the best-selling gaming console of its time, the NES is also the origin for today's biggest game franchises, like Final Fantasy, Mega Man, and Metroid! But that's not all, the PlayMore Multi-Platform Handheld Gaming Entertainment System also provides support for today's most popular digital music and video formats, so when you need a break for gaming, relax with a few relaxing tunes or movies. Ready to handle all of your gaming and entertainment needs, relive the retro gaming favorites with the PlayMore. It's in stock in our warehouse right now, so order one today and we will express ship it out tomorrow - that is a guarantee you can't get from any other China supplier! Brought to you by the leader in factory-direct electronics - Chinavasion. Emulation: NES, GBA, Sega Genesis, More! It is your responsibility to follow the laws of your local country in regards to copyright, creation, and usage of ROM files. Please read http://en.wikipedia.org/wiki/ROM_image#Legal_status to find out more. Chinavasion does not provide any ROM images, nor can we be held responsible or liable for anything that happens as a result of downloading ROMs.